This firm pillow top Mattress features Serta's new 711 Firm Individually Wrapped Coil Innerspring featuring durable, flexible wrapped coils that react individually to every contour of your body. It has a special coil gauge design that helps create a firmer feel across the entire Mattress. 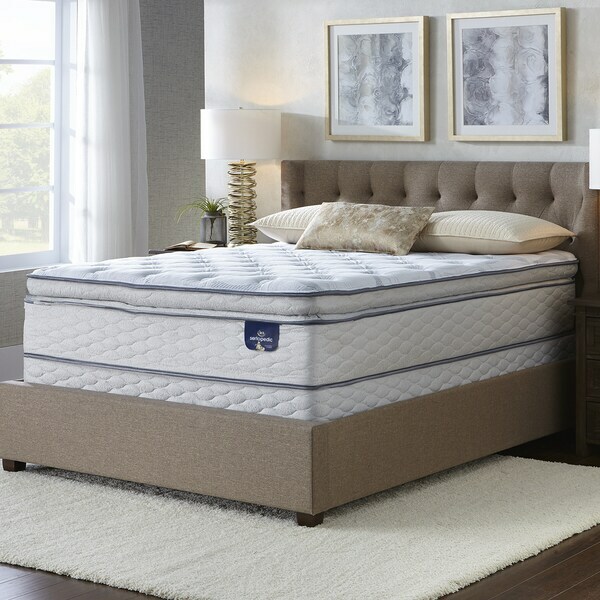 Plus, a layer of Serta Comfort XD Foam gently cradles the body for enhanced pressure relieving comfort while Serta's Cool Twist Gel Foam provides enhanced, breathable comfort. Something is really wrong with this item. My daughter slept in it for 2 nights and it has sunk in 4 inches and left huge body imprints. She weighs 120lbs.... I am working with Overstock to return them and this is proving to be a challenge. We bought 2. We don't want either. We needed a much improved mattress and I did not want memory foam. The mattress is definitely on the firmer side but gives a great nights rest- no waking up multiple times throughout the night. Fast shipping, easily scheduled delivery personnel. We sleep wonderfully on this mattress. Just enough pillow-top to make it comfy...but also firm to support our aging bodies. After shopping in various stores and being shocked at the prices, decided to try to order a mattress online. Took a chance on this Serta. It is amazingly well constructed and comfortable. We ordered the firm, pillow top. I’ve never slept better. The delivery took A few days, but the mattress was set up and old one hauled away by courteous deliverers. We also purchased a platform bed with headboard. The 12.5 in high mattress makes it the perfect height without needing a spring foundation. As I write this, I am sitting completely snug and happy on my new mattress. I had been sleeping on a hand-me-down mattress that was almost 30 years old. I was finally able to save enough money to be able to buy a new one. I saw that Overstock was having a fantastic Black Friday sale on mattresses, and I couldn't say no. I was skeptical to purchase something without laying on it first, but I trusted the reviews. Plus, I thought, it can't be any worse than what I had been sleeping on for the last 15+ years. The ordering process was seamless, though there was some tracking issues. I was not able to access the tracking number through the Overstock website, but one call to Customer Care and this was taken care of. The guys who delivered the mattress (2 weeks later) were kind, professional and quick. They removed my old mattress and had the new one on the box spring in less than 5 minutes. I am happy to report that this mattress is everything I'd hoped it would be and more. It's incredibly comfortable... like sleeping on a cloud. It's firm enough to be supportive, but soft enough to completely sink into. It completely envelops me and relieves all the tension points I had been suffering from in my hips and shoulders. I've only slept on it two nights so far, but this is the first time in many years that I've woken up without any pain. This is a really big deal to me. So if you are on the fence, I honestly couldn't recommend this more. I hope it holds up, but so far so good. 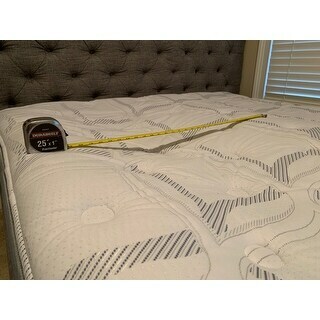 Mattress already has 2 dips and had it less than 2 months. Serta will allow it to be returned when the dips reach 1 1/2 inches so will wait for that. We had been searching for a comfortable bed for an extremely long time coming across the listing we were skeptical about purchasing a bed online being unable to sit feel and touch the bed was concerning. We finally pulled the trigger since the description and everything seemed to match our criteria. the bed is firm but not too firm keeps my body temperature well regulated, we finally found a mattress that I don't overheat on top of. I highly recommend this mattress to anyone. Delivery was smooth and fast received the product less than a week after order! Love the depth of the mattress. Nice quality. Pillow top is firm but comfortable. White glove service was amazing- included without even having to ask! This arrived on time and was taken out of the shipping box. The box was taken away by the delivery agent. It’s firmness is as I ordered and sleeps comfortably to me. I wouldn’t have thought to buy a mattress online, but was encouraged by my friend and the return option. I am most happy with this purchase. Absolutely the most comfortable mattress I have ever slept on!! Including the 2500.00 set on my king size bed. Great upgrade over a furniture store brand memory foam mattress that made sleep absolutely miserable. This mattress is like sleeping in the clouds. Decent support with a plush top and much cooler to sleep in than the previous monolith of gelatinous torture. Very good mattress. My only issue is no lumbar support when I lay on my back I sink down in the bed. Great mattress for the money. Note box spring not included. I purchased this mattress because both my husband and I suffer with back pain. Overall, it's a good mattress, but not great. We're satisfied with the price and shipping was quick and hassle free. Got it for my mom and she is extremely pleased. Delivery was excellent too. Overall happy with my purchase. The mattress a true FIRM, even though it is a pillow top. I paid additional for room delivery which was a lifesaver. It took about two weeks from order date to product arrival. I wish it was a tad bit softer but it does the trick.. I think what I loved most was the delivery and removal of my old mattress. It's not the Best mattress but for the price it will do..
Mattress is firm but still forms to your body! Love it! "Will this mattress work with an adjustable frame? Does it come in Twin XL??" "I've had this mattress for about 2 months now. It has quickly formed large puffy rows - places where the pillow top has "puffed up" higher than the rest of the mattress. They seem to form right where I'm sleeping. Has anyone else noticed this? Defect, or is this normal? First time with a pillow top. Thank you!" We had this for 2 months and now it has large body indents where we sleep. We are average sized people. 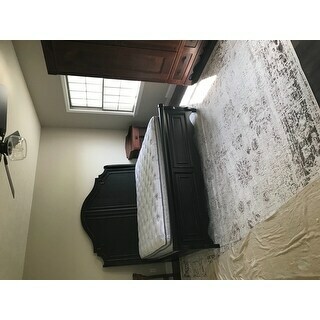 Terrible quality mattress! "Will this work with a metal box spring I purchased elsewhere? And will this also work using a metal frame that adjusts to the full mattress?" Yes, any non-yielding frame of foundation. Yes, I purchased a wood box spring that works fine and makes the bed higher. I purchasd a dark expresso color step stool from Overstock to comfortably get in the bed. It blends in perfectly with the color of the bedroom set. "Do I need a box spring for this mattress"
A box spring is recommended for additional support but not required as long as the mattress has adequate support. "Is this mattress delivered rolled up in order to get it up the stairs easier?" No, this is a traditional mattress and not a Mattress-in-a-box. I have priced Serta pillow tops and this seems like a great deal. "Will this mattress fit in my 72" X 84" waterbed frame?"